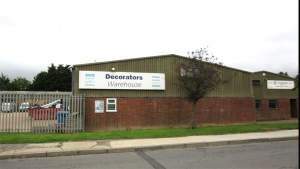 Decorators Warehouse sells everything the modern painter decorator could need at extremely competitive prices. We’ve been supplying Hailsham’s professional tradespeople and homeowners with a wide range of paints, wallpapers, tools, fillers and thinners, decorating materials and access equipment for years. If it isn’t in stock, we’ll order it in and we can even deliver to your door. We think of ourselves as a decorator’s best friend, and we’re never too busy to give you help and product advice. You’ll find us opposite the car wash at the A22 Hailsham bypass end of Diplocks Way. There’s free customer parking directly outside so it’s easy to load up your van with bulky purchases. From the A259, turn on to Diplocks Way and continue on to find the branch near the end of the road on the right hand side. From the Hailsham By-Pass, at the roundabout take the second exit on to Diplocks Way. The branch is a short way down on the left hand side. From Gleneagles Drive, at the roundabout take the first exit on to Diplocks Way. The branch is a short way down on the left hand side.